We hired our contractors to do some asbestos popcorn ceiling removal last week and we had to clear most of our stuff away from the rooms. Sadly, this means lack of blogging and more unfortunately, the lack of sewing. My hands are aching from the absence of my sewing machines (I am constantly trying to keep my carpal tunnel at bay, and sewing let me use my hands in a different motion than typing, thus is a great remedy and relief for my hands! Isnt that an awesome excuse for sewing?). Heidi prom dress from burdastyle — failed because flimsy polyester slippery thin fabric for both lining and SHELL is just impossible to work with!! Mccall dress — failed because that color and thick cotton quilting fabric with the extensive gathering looked a little, horrifying on me, I dont think I want to subject any of my friends or reader to that combo even though it WAS going to be well made! Vanessa skirt –It is actually a really cute skirt! but my sewing skill at that time was just not good for it, polyester shell doesnt help its appeal either! And there was more! I dont know what I was thinking back then and why I even bothered shopping for fabric at walmart!! Looking at those pieces, I am slightly horrified. But I could not bear to part with them in the last move. I think it was because I am a person who learns by exploring and experimenting, and I get better through making mistakes. However, I have kept the failures for almost 2 years in the closet and have never needed them or even thought about them. So after much debate with myself, I decided that it is time to let go. There they went, into our recycling bin! (Sorry, they are not good enough even to give away!). What kind of mistakes did you make when you started out? What do you do with your un-wearable and un-mentionables? This entry was posted on Thursday, March 25th, 2010 at 11:21 pm	and tagged with failures, sewing and posted in mistakes, sewing. You can follow any responses to this entry through the RSS 2.0 feed. Btw, clothes can be recycled? I didn’t know that. We recycle everything else. Normally, I just give it away to Good Will. Hmm..I guess that’s recycling also. aww! Maybe we were still burnt by the mistakes me made, and only when we are convinced that we wont be making those mistakes again, we destroy the evidence! 🙂 Im glad you shredded the rejection letters! Are you keeping the acceptance letters? I dont know where mine went! lol! and yeah! City of san Jose recycle fabrics! It also recycle plastic bags, and almost everything else. Its AWESOME! I did finally give away the horrible dress I made (waist seams at my natural waistline are to be avoided). The fabric was a fine choice, though I didn’t care for the polyester in the poly-cotton blend. I kept it to remind myself that I have good technical skills and that I need to pair them with good fashion skills. I nailed the notched collar on that dress on my very first try! I did hang the dress where I could see it and be reminded of these facts, but when I moved my sewing room last, I decided to put it in the giveaway bag. I’ve kept my failed projects, too. 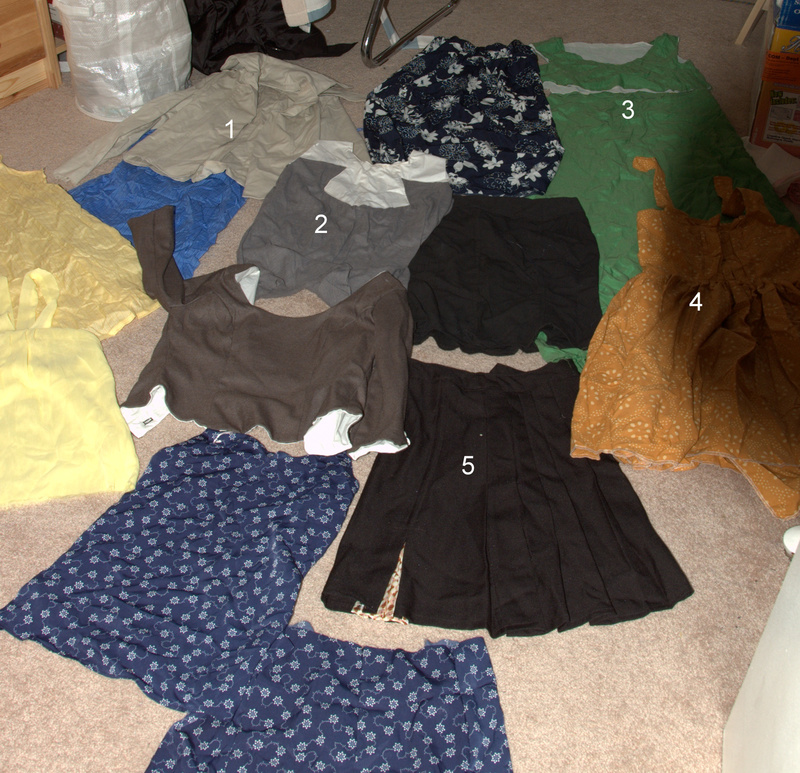 However, I need to do some spring cleaning and re-organizing… I guess I should do something with them, too. hehe, its always sort of entertaining to look back at our failed projects too! hopefully yours isnt as unwearable as mine!